The first depicts day time, the garden of Eden, the narrow road which leads to heaven (the golden city) and the three crosses on the hill. The second depicts night time, Mount Sinai where Moses received the ten commandments and the golden city (Heaven). 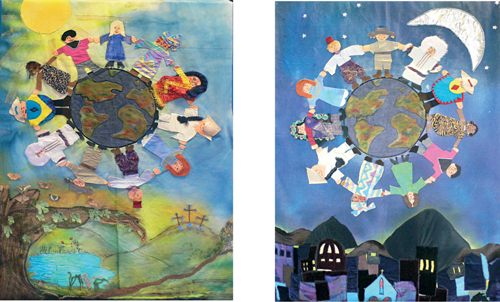 Both banners feature a spray painted background and are complete with characters dressed in costumes from around the world.